A Flying Laboratory AIRSAR instrument (panels behind wing) mounted aboard a modified NASA DC-8 aircraft. During data collection, the plane flies at 8 kilometers over the average terrain height at a velocity of 215 meters per second. AIRSAR Instrument-Antennas The AIRSAR radar antennas on the back part of the DC-8 aircraft. These antennas are used to collect data in all three modes. 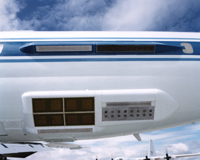 L-band ATI uses an additional antenna (not shown) located in front of the wings. In POLSAR mode, fully polarimetric data are acquired at all three frequencies.� Fully polarimetric means that radar waves are alternatively transmitted in horizontal (H) and vertical (V) polarization, while every pulse is received in both H and V polarizations.� POLSAR data are sensitive to the geometry (including vegetation) and dielectric properties (water content) of the terrain. Land Classification Polarimetric data over coastal Thailand in an area of mangrove forests along the coast, agriculture and fish farming (square ponds). In TOPSAR mode, AIRSAR collects interferometric data using C- and L-band vertically-displaced antenna pairs to produce digital elevation models (DEM's). The radars which are not being used for interferometry (P-band for XTI2 or P-band and L-band for XTI1) collect quad-pol data co-registered with the C-band DEM. Interferometric data can be collected in "ping-pong" mode, where each antenna is used alternately for transmit and the effective baseline is doubled, and in "common-transmitter" mode where only one antenna is used for transmit. Topographic Mapping Topographic radar data over the Ray Mine in central Arizona. Colors show elevation information from the mine pits in the center of the image up through the surrounding mountains. These data are being used for mine site and watershed characterization associated with environmental assessment of the area. Data collected in the along-track interferometry (ATI) mode can be used to measure ocean current velocities.� Two pairs of antennas, one C-band and one L-band, separated along the body of the plane, are used to collect ATI data. Measuring Current Movement Along-track interferometry radar data collected in the area of the Golden Gate Bridge, San Francisco, California. Colors in the water indicate differences in the direction and amount of current movement as water flows into and out of the bay. AIRSAR enables researchers to develop and test new radar technologies for spaceborne operations. Polarimetric SAR instrumentation demonstrated by AIRSAR was flown as the shuttle imaging radar-C (SIR-C) mission in 1994. More recently, the February 2000 Shuttle Radar Topography Mission mapped the world with a technique similar to, and demonstrated by, AIRSAR�s TOPSAR mode. An 80MHz bandwidth option - achieving 1.5m resolution - has been incorporated into AIRSAR in support of a future spaceborne radar mission. Currently under development are modes which combine polarimetry with cross-track interferometry and along-track interferometry. 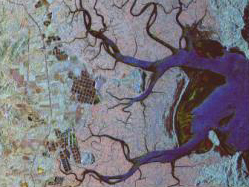 AIRSAR�s polarimetric and interferometric capabilities provide data for a wide range of applications including biomass estimation, soil moisture measurements, vegetation classification, land-use classification, slope estimates for natural hazard studies, along-track interferometry to measure coastal currents, wetland and flooded forest classification, natural hazard monitoring, geologic mapping, and glacier studies.